For over 35 years, the Mathews family has been fortunate to be an integral part of the Sandusky community. In that time, we've learned a thing or two about how to be one of the best Lincoln dealerships in Ohio. We have a strong and committed staff with many years of experience satisfying customers' needs. Since 1979, we've given our customers a unique buying experience, treating you like a friend and not another number. We pride ourselves on doing business the right way. That's why we create a no-pressure buying experience for everyone who visits. Everything is done with you in mind! With a multitude of new, pre-owned and certified pre-owned vehicles to choose from, you'll always find the right vehicle at a price you'll love. Feel free to browse our inventory online, request more information about vehicles, set up a test drive or inquire about financing. If you don't see what you are looking for, click on CarFinder, fill out the form and we will let you know when vehicles arrive that match your search. Or if you would rather discuss your options with our friendly sales staff, click on Directions for interactive driving directions and other contactinformation. After you make that important investment, let our knowledgeable, factory-trained technicians treat your vehicle as if it were their own. We only use original parts unlike retail chains and corner shops. No one knows your vehicle better than our experts. 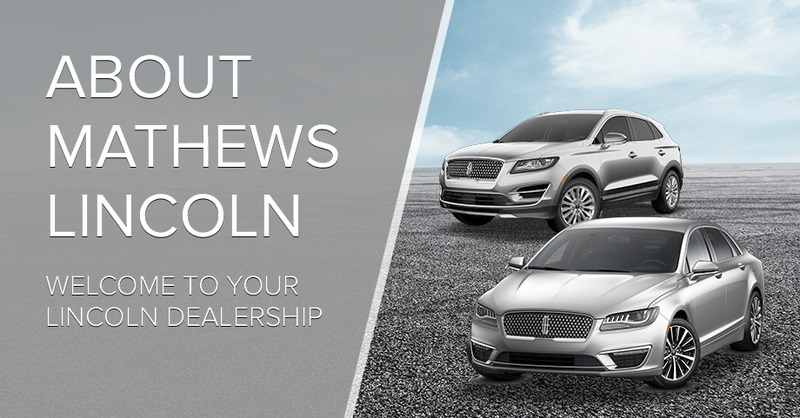 We're committed to giving you the Mathews Lincoln experience now and after the sale. As you can see, we've got your back every step of the way. Come experience Mathews Lincoln and see for yourself. We look forward to serving you!